The full price of the Lapland Letter includes all shipping and posting costs Lapland Letters send magical letters to anywhere in the world. To ensure that all Lapland letters are delivered on time, international orders will not be accepted after the 6th December 2019. United Kingdom orders will not be accepted after 16th December 2019. All prices include 17.5% VAT where applicable and this is chargeable on all orders within the European Union. Because of the increased postal charges to send your letter outside of the European Union, the price does not include VAT but takes into account the extra postal charges and an administration charge. We will try to ensure that your order is delivered before Christmas and on time. However, we not accept any responsibility for late or failed delivery if outside Lap Land Letters post masters control. 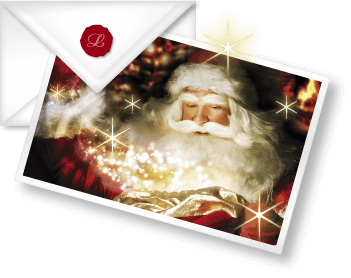 The names, addresses and birth dates used to complete your magical lapland letter can only be checked by you the customer, Please ensure the details are correct at the time of confirmation. Lapland Letters accounts department will make sure your payment is taken in full at the time of ordering your magical letter. The Lapland letters prices listed on the website are in UK pounds sterling, US dollars or euros. The lapland letters post master reserves the right to change any advertised price at any time. Payment made from a credit card or debit card will be exchange to the amount charged to the currency of your country at the current rate charged by your credit/debit card company. Your confirmed order for a Lap Land Letter has been confirmed by email which includes a booking reference number. Our Magic Reindeer food is a must for any child with an imagination and who believes in Christmas. SECRET RECIPE made from Mrs Claus very own recipe!! using natural ingredients and Lapland magical edible star dust. Sprinkle outside with your child to guide the reindeers to your home. Magic works only on the night of Christmas eve.